Works with: 3DS Software compatible devices. 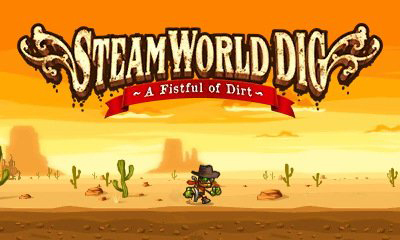 The second game in the SteamWorld Universe was a bit of a surprise when it was released. I am a big fan of side scrolling games and the game looked pretty interesting, so I decided to pick it up. The world of SteamWorld is full of many tales and this particular story begins in a sleepy little desert town called Tumbleton. The population of three is about to have their sleepy world changed forever as Rusty wanders in to take over his Uncle Joe's mine. On his way to the mine, Rusty accidentally falls down a deep hole into the deep underground. Upon recovering from his descent, Rusty runs into a malevolent flower.. wait... wrong game. Actually, Rusty runs into a young Steambot named Dorothy who informs him that Joe is a bit less for the wear and that Rusty will need a something to get to the switch to help them both escape the mine. Upon finding his Uncle's "remains" and procuring a pickax, Rusty's real deal of an adventure begins. But is this cave story worth your time? Upon grabbing his pickax, Rusty sets to work digging and hacking away at the tough ground around him. 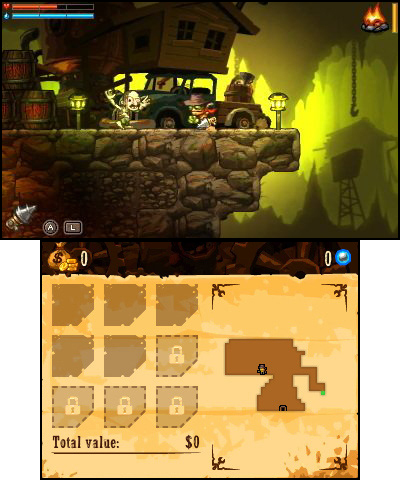 Essentially, this is how SteamWorld Dig works. Rusty has a limited amount of life, health, and water to use while digging through layers of dirt, rock, gems, and caves. The basic structure of the game is to work toward places marked on your map by digging toward those sections and picking up gems along the way. You sell the gems in town to level up and upgrade your abilities to allow you to go deeper into the mine. 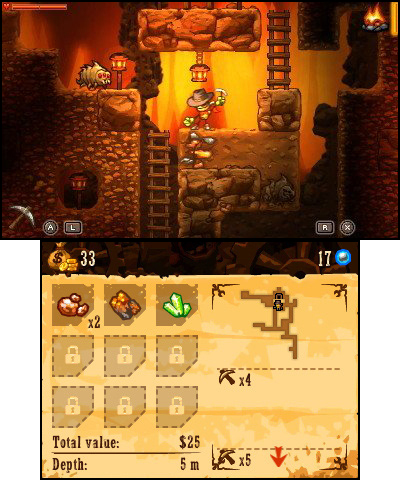 Along the way, you find objects to help you and the town above grows as you explore the mine. All of this leads up to a deeply buried and highly dangerous secret revealed through a stream of discoveries inside the mine. The mine is different in every play through, so the locations of gems and enemies is always a surprise on replays. There are also items to allow you to exit the mine when you need to, even a "self-destruct" button if you find yourself somehow trapped between rocks and more rocks. Although, most players will never have to use that option. It reminds me a bit of games like Terraria, Minecraft, and Boulder Dash. Boulder Dash was my favorite game on the Commodore 64, so having that digging aspect combined with the constant tapping of the A button to break through the merciless and unfeeling rock standing in my way is an oddly nostalgia laden experience to me. Hated: ...except that, about half way through the game, there are parts where you feel like you are hunting for gems to progress because you will feel stuck in the game. This can be brought about even earlier because of the "lose 50% of your money" penalty that the game has when (or if) you die by running out of health or being crushed by a rock. This could frustrate some players. The world inside this cave is fantastically detailed and the 3D effect works really nicely. You can see all sorts of weird details in the backgrounds, the characters are all really well animated and some of the physical changes that Rusty undergoes in his upgrades are visible on him. Generally, this title looks really nice. The cut-scenes and dynamic lighting are a great touch. The robot designs are more dynamic and represent the "old timey" aesthetic of Steam Punk culture nicely, while incorporating an "Old West" feel. Think of it as a mechanical tribute to The Wild Wild West. I can certainly see a little bit of Robert Conrad in the design of Rusty. It must be the dandy hat. In game dialogue is accompanied by close up pictures of the various denizens of Tumbletown and they are pretty stylize. Sadly, they are not animated because that would be an awesome thing to see. The game also borrows from the side of Steampunk that is distinctly attached to horror. I will not say how attached to that genre this game is; as I would prefer to not spoil some interesting story elements. Visually, breaking into a new layer is exciting and uncovering the dark, dank, and dreary discoveries with in the mine is a quite interesting sight to behold. Some people have described the characters as being Burton-esque, but I hardly think that is a fair comparison. The humans look like something Robert Crumb would create and the robots look like something Jhonen Vasquez cooked up. I really enjoy the way this game looks and I like the designs of the robots. Liked: The visual style of this game is fantastic and there really is some great detail and animation in this game. There are all sorts of environment additions, like steam rising from Rusty, or the quick flashes of light when cold pickax (or other digging implement) hits hard rocks. Hated: Sometimes, the darkness can be a bit claustrophobic and the lowered visibility thanks to the dynamic lighting means that a lot of that great detail will be missed. (Upgrade your lamp.) The close up things are not animated, I suppose? That always seems like a missed opportunity to me. Of course there has to be a stylized "sound similar" version of the classic "The Ecstasy of Gold" by Ennio Morricone. It would feel wrong to exclude such a staple in a "Western" style game. The rest of the music would be a mix of slow industrial mixed with Western sounding instruments. This makes the game sound a little like the rogue-like game, Diablo. Which, to be fair, this game does share a bit of that spirit. You dive into the mine, get loot, return to town, and then keep exploring to find the horrors hidden below. It really is a bit like Diablo and the music inside the mine lends itself to that same sense of foreboding atmosphere. The music is done by Electroacoustic artist Jonas Kjellberg and veteran game composer Mattias Hammarin and they do a great job on creating some fairly moody music. Nothing that is really a "toe tapper," but it will do the trick in setting you up with a digging mood. The sound effects let you know the difference between the rocks when you hit them and can also be a clue when you hear some unholy creature sparking to life as you move along. The characters in town tend to also speak with a mixture of distinct whirs and ticks in place of voice acting. Each of the digging items sounds differently and there is some mumbling from the more unusual inhabitants of the deep. Liked: The music and sound effects fit the mood of the game and add a sense of depth to this spelunking adventure. Hated: I really have no complaints in the sound and music department. There is nothing that is going to stand out as catchy, I suppose? 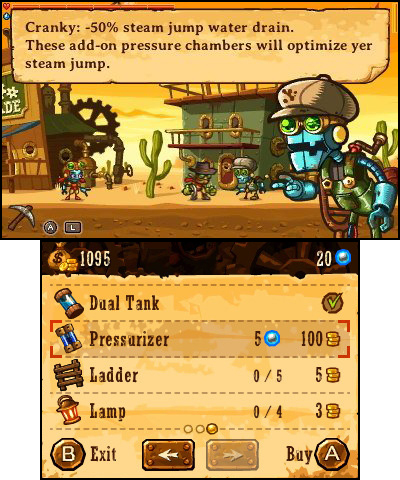 SteamWorld Dig is easy to control, but it has a bit of a learning curve that may be off putting to younger or less focused players. The game does offer a decent amount of challenge and there is a bit of strategy to how you go about removing gems and other items from the mine. The map on the bottom is easy to read and tells you how many hits the ground in each layer requires from your digging tools. Keeping track of goals and where you are on the map is pretty easy to do. There is no support for the extra buttons on the New 3DS units or for the Circle Pad Pro, but this game works fine without the extra buttons. The hit box for some of the enemies is a bit limited and you will find that you get injured when attacking things that attack you with some of your weapons. The upgrades make sense and work well for helping Rusty traverse the underground world. Aside from a little bit of pacing slowdown in the middle of the game and a bit of balance issues with penalties, this is a rather solid package. It has a strong central dungeon/mine and an interesting story with unique characters. The only thing I think the game could really need is a "difficulty" slider that reduces the penalty for dying and changes the prices for some items to make it more accessible to a wider audience. When you die, you lose half of your money, which makes it harder to buy the updates that Rusty needs to progress further in the mine. While you can still go and retrieve the loot that you dropped, the money you had is cut in half. 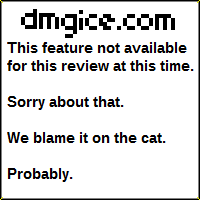 This could be a source of frustration with some game players. Liked: A well made and compelling game with easy to learn play control and an interesting combination of gameplay elements. Hated: It needs a difficulty slider that decreases or increases the penalty for dying. Having beaten the game a few times, I would love an "iron man" mode that would just make you start at the beginning of the game when you died. Maybe make that a special mode for the game that unlocks once you beat the game once? It is also a little bit short, which is why difficulty options would increase the replayability of the game. A difficulty slider to make the game easier or harder would be a nice addition. Also, the ability to collect and wear a variety of hats would be pretty cool. Just saying that would be an awesome thing to add in some future version of this game. Games like Terraria, Metroid 2 (specifically because of the "atmosphere"), Boulderdash. 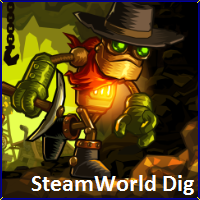 SteamWorld Dig is a truly unique game with an interesting premise and solid execution. While it may be a bit unforgiving to some players, it is well worth the time investment to more experienced gamers or people who want to try a fairly unique take on platforming exploration games. I think that you should probably pick this one up if you are interested in exploration heavy games with a bit of SteamPunk flair. I guess you could say that I DIG it a lot. Bury me with my puns.